K S Rajan, the current Bharatiya Janata Party Kerala state secretary, was one of the persons whose testimony helped Rajya Sabha Deputy Chairman Prof P J Kurien dodge probe in the Suryanelli case. Though the victim accused Kurien, he did not face trial as there was a strong alibi in K S Rajan's version. Rajan, who was then the Alappuzha BJP district secretary, now says his testimony was not correctly recorded by Sibi Mathews, the police officer who was leading the investigation. The time, as Rajan now claims, he saw P J Kurien at Idicula's house in Thiruvalla, combined with Mrs Idicula saying that it was “about tea-time” make the alibi fail for the deputy chairman. In an interview with rediff.com Shobha Warrier, K S Rajan explains why he has changed his version now. When the Suryanelli case was first probed, your deposition helped P J Kurien not be included in the list of the accused. Your statement to the investigating officer was one of the strong alibis he had. Why have you changed your version now? I have not changed my deposition. I am reiterating what I said then. 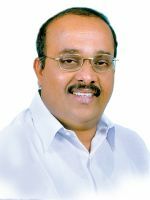 I was the treasurer and board member of the Umayattukara Service Co-operative Bank. I and the bank president, Charlie Abraham, a Congress leader, and Kuruvila Jacob, an advocate who was a board member, went to Idicula's house for deposit mobilisation. The house was close to the Thiruvalla bus stand and when we came to know that Idicula was at home, we had gone there for canvassing. We had started our rounds around 2.30 pm and around 5 pm we reached Idicula's house. It was not after 6 pm because by 7 pm I was back at home. We met P J Kurien there. That was the first time that I was meeting him. He left when we were still there. I was asked by the investigating team whether I saw P J Kurien there and I said, yes, I did meet him on the 19th of February, 1996. Didn't you mention the time when questioned? It was around 5 pm and I had told them that I met him in the evening. At that time, I didn't know the time was that important, and there was no discussion about it. When this case became hot news, I was the BJP candidate in the Chengannur Assembly segment. The newspapers wrote that I had said Kurien was not that kind of a person. I immediately clarified that I never said anything of that sort. I only said I saw him at Idicula's house. When were you questioned by the police about P J Kurien? It was after some time that an investigation team under IPS officer Siby Mathews called us to the Thiruvalla guest house. We went there. There was no questioning and they did not even take our testimony. It was more like a friendly chat and we were asked many things. At that time, I had told the team that I met P J Kurien around 5 pm at Idicula's house. I never said I met him at 7 pm. Now, when things have again heated up, and the time I mentioned has become very important, I decided that I had to clarify my stand. I am very sure that it was around 5 pm that I met him there. When it was known that Kurien did not figure in the list of accused because the time mentioned by you and Charlie Abraham was 7 pm, why didn't you clarify it then? The time was never discussed in the papers and I had no idea it was that important. It is only now that the time is being talked about. I had told the investigation team that it was around 5 pm and not 7 pm. Didn't you know that you were his strong alibi because if he was there at 7 pm, there was no way he could reach Kumali by 8 pm? Yes, when we said we saw him at Idicula's house, it might have helped him. That is also the truth. We met him there on that day. Only the time mentioned by the investigation team is not accurate. I also saw it in the papers. We have not been in touch for many years. I haven't asked him about this. After we met Idicula, the very next day, Charlie Abraham told me that he deposited Rs 2 lakh in the Thiruvanmandoor branch of our bank. So, when the team questioned us, it was he who reminded me that it was on the 19th that we went there. If you look at the date when he deposited the money, you will know when we met Kurien. It is a fact that we met Kurien at Idicula's house around 5 pm. You said in a recent press conference that you were offered money to be of help to Kurien. What exactly happened? When my testimony helped P J Kurien, some Congress leaders came and offered me monetary help which I flatly refused. I only stated the truth and didn't want any help from anyone. Don't you feel that changing your testimony will have an impact on Kurien's stance right now? If he has been involved in the case, he should be ready to face the probe. If he has not gone there, he would be termed innocent. Whatever it is, we should know the truth. Though it is said that ours is a crucial statement, we were never called to the court or we have not given a proper testimony. Except a friendly chat with the investigation team at the guest house, we have not given any testimony. You should understand that whatever I said that day was neither to rescue nor not rescue Kurien. I only said the truth. Do you feel he should resign and face the probe? Absolutely. Whatever the party decides is my opinion too.